Homo habilis is a species of the tribe Hominini, during the Gelasian and early Calabrian stages of the Pleistocene period, which lived between roughly 2.1 and 1.5 million years ago,  with a possible discovery of a fragment of a jawbone intermediate between Australopithecus and H. habilis dated to 2.8 million years ago reported in 2013. A team led by scientists Louis and Mary Leakey uncovered the fossilized remains during the time frame of 1960-1963 at Olduvai Gorge in Tanzania; these fossils were speculated to be a new species, and called Homo habilis ("handy man"), because they suspected that it was this slightly larger-brained early human that made the thousands of stone tools also found at Olduvai Gorge. 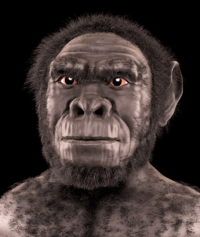 In its appearance and morphology, H. habilis is the least similar to modern humans of all species in the genus Homo (except the equally controversial H. rudolfensis), and its classification as Homo has been the subject of controversial debate since its first proposal in the 1960s. There has been scholarly debate regarding its placement in the genus Homo rather than the genus Australopithecus. The small size and rather primitive attributes have led some experts (Richard Leakey among them) to propose excluding H. habilis from the genus Homo and placing them instead in Australopithecus as Australopithecus habilis. Louis Leakey, the British-Kenyan paleoanthropologist who was the first to suggest the existence of H. habilis, and his wife, Mary Leakey, found the first trace of H. habilis in 1955: two hominin teeth. These were later classified as "milk teeth", and therefore considered difficult to link to taxa unlike permanent teeth. However, in 1959, Mary Leakey recovered the cranium of a young adult which had a small brain, large face, tiny canines and massive chewing teeth (which earned it the nickname of "The Nutcracker man"). H. habilis was short and had disproportionately long arms compared to modern humans; however, it had a less protruding face than the australopithecines from which it is thought to have descended. H. habilis had a cranial capacity slightly less than half of the size of modern humans. Despite the ape-like morphology of the bodies, H. habilis remains are often accompanied by primitive stone tools (e.g. Olduvai Gorge, Tanzania and Lake Turkana, Kenya). Homo habilis has often been thought to be the ancestor of the more gracile and sophisticated Homo ergaster, which in turn gave rise to the more human-appearing species, Homo erectus. 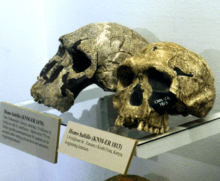 Debates continue over whether all of the known fossils are properly attributed to the species, and some paleoanthropologists regard the taxon as invalid, made up of fossil specimens of Australopithecus and Homo. New findings in 2007 seemed to confirm the view that H. habilis and H. erectus coexisted, representing separate lineages from a common ancestor instead of H. erectus being descended from H. habilis. An alternative explanation would be that any ancestral relationship from H. habilis to H. erectus would have to have been cladogenetic rather than anagenetic (meaning that if an isolated subgroup population of H. habilis became the ancestor of H. erectus, other subgroups remained as unchanged H. habilis until their much later extinction). Its brain size has been shown to range from 550 cm3 to 687 cm3, rather than from 363 cm3 to 600 cm3 as previously thought. A virtual reconstruction published in 2015 estimated the endocranial volume at between 729 and 824 ml, larger than any previously published value. H. habilis' brain capacity of around 640 cm³ was on average 50% larger than australopithecines, but considerably smaller than the 1350 to 1450 cm³ range of modern Homo sapiens. These hominins were smaller than modern humans, on average standing no more than 1.3 m (4 ft 3 in) tall. A fragment of fossilized jawbone, dated to around 2.8 million years ago, was discovered in the Ledi-Geraru research area in Afar Regional State in 2013. The fossil is considered the earliest evidence of the Homo genus known to date, and seems to be intermediate between Australopithecus and H. habilis. The individual in question lived just after a major climate shift in the region, when forests and waterways were rapidly replaced by arid savannah. One set of fossil remains (OH 62, for "Olduvai Hominid specimen 62"), discovered by Donald Johanson and Tim White in Olduvai Gorge in 1986, included the important upper and lower limbs, specifically the humerus and femur. Their finding stimulated some debate at the time. Locomotor affinities of OH 62 have been assessed primarily on the basis of its forelimb to hind limb proportions, which are known to be associated with locomotor behavior among living primates. Initial analyses concentrated on comparisons to the Australopithecus afarensis A.L. 288-1 ("Lucy"). In most dimensions—measured or estimated—the OH 62 upper limb remains equaled or exceeded those of A.L. 288-1, while its lower limb remains (principally the femur) appeared to be smaller. In particular, using a length estimate for the humerus of 264 mm, and a length estimate for the less complete femur of ‘‘no greater than that of A.L. 288-1 (280 mm),'' a possible humerofemoral length index is close to 95%, which is more like that of modern chimpanzees (averaging about 1.00) than modern humans (averaging about 0.72). In this sense, it was more ‘‘primitive'' than A.L. 288-1, with a length index of 0.85. KNM ER 1813 is a relatively complete cranium which dates to 1.9 million years old, discovered at Koobi Fora, Kenya by Kamoya Kimeu in 1973. The brain capacity is 510 cm³, not as impressive as other early specimen and forms of H. habilis discovered. OH 24 (Twiggy) is a roughly deformed cranium about 1.8 million years old discovered in October 1968 at Olduvai Gorge, Tanzania. The brain volume is just under 600 cm³; also a reduction in a protruding face is present compared to members of more primitive australopithecines. OH 7 dates to 1.75 million years old, and was discovered by Mary and Louis Leakey on November 4, 1960 at Olduvai Gorge, Tanzania. It is a lower jaw complete with teeth; due to the size of the small teeth, researchers estimate this juvenile individual had a brain volume of 363 cm³. Also found were more than 20 fragments of the left hand. Tobias and Napier assisted in classifying OH 7 as the type fossil. The OH 7 hand of Homo habilis combines traits associated with a precision grip and adaptations related to climbing which fits well with the semi-long, humanlike hindlimb proportions and a rather chimpanzee-like upper-to-lower arm ratio. KNM ER 1805 is a specimen of an adult H. habilis made of three pieces of cranium dating to 1.74 million years old from Koobi Fora, Kenya. Previous assumptions were that this specimen belongs to H. erectus based on the degree of prognathism and overall cranial shape. Based on dental microwear-texture analysis, Homo habilis (as well as other early Homo-class hominins) likely did not specialize on particularly tough foods. Microwear-texture complexity is, on average, somewhere between that of tough-food feeders and leaf feeders (folivores.) These measurements are analyses of the percentages of tooth surface structure containing "pits" (frequency and depth of dental damage resulting from consumption of certain foods across species). It is a heavily used, and henceforth widely accepted as reliable, measure of wear that a species, on average, endures from eating certain food. These measurements point to an increasingly generalized, and generally omnivorous diet in Homo habilis. Homo habilis is thought to have mastered the Lower Paleolithic Olduwan tool set which used stone flakes. H. habilis used these stones to butcher animals and to skin the animals. These stone flakes were more advanced than any tools previously used, and gave H. habilis the edge it needed to prosper in hostile environments previously too formidable for primates. Whether H. habilis was the first hominid to master stone tool technology remains controversial, as Australopithecus garhi, dated to 2.6 million years ago, has been found along with stone tool implements. Homo habilis’ fore-to-hindlimb joint size resembles a more primitive A. afarensis which is less similar to humans, which suggests that maybe Homo sapiens aren’t as similar to Homo habilis as proposed. The body proportions for H. habilis are in accordance with craniodental evidence suggesting closer association with H. erectus. Most experts assume the intelligence and social organization of H. habilis were more sophisticated than typical australopithecines or chimpanzees. H. habilis used tools primarily for scavenging, such as cleaving meat off carrion, rather than defense or hunting. Yet despite tool usage, H. habilis was not the master hunter its sister species (or descendants) proved to be, as ample fossil evidence indicates H. habilis was a staple in the diet of large predatory animals, such as Dinofelis, a large scimitar-toothed predatory cat the size of a jaguar. Homo habilis coexisted with other Homo-like bipedal primates, such as Paranthropus boisei, some of which prospered for many millennia. However, H. habilis, possibly because of its early tool innovation and a less specialized diet, became the precursor of an entire line of new species, whereas Paranthropus boisei and its robust relatives disappeared from the fossil record. H. habilis may also have coexisted with H. erectus in Africa for a period of 500,000 years. ↑ Friedemann Schrenk, Ottmar Kullmer, Timothy Bromage, "The Earliest Putative Homo Fossils", chapter 9 in: Winfried Henke, Ian Tattersall (eds. ), Handbook of Paleoanthropology, 2007, pp 1611–1631, doi:10.1007/978-3-540-33761-4_52 This date range overlaps with the emergence of Homo erectus. New York Times article Fossils in Kenya Challenge Linear Evolution published August 9, 2007. 1 2 Villmoare B, Kimbel H, Seyoum C, Campisano C, DiMaggio E, Rowan J, Braun D, Arrowsmith J, Reed K. (2015). Early Homo at 2.8 Ma from Ledi-Geraru, Afar, Ethiopia. Science. DOI:10.1126/science.aaa1343 See also e.g. "Oldest known member of human family found in Ethiopia". New Scientist. 4 March 2015. Retrieved 7 March 2015. , Ghosh, Pallab (4 March 2015). "'First human' discovered in Ethiopia". bbc.co.uk. Retrieved 7 March 2015. .
↑ Mark Collard and Bernard Wood, Defining the Genus Homo; 2015 ; quote p2137: "Wood and Collard’s (1999) proposal to remove H. habilis and H. rudolfensis from Homo and assign them to a different genus or pair of genera remains valid." ↑ Wood and Richmond; Richmond, BG (2000). 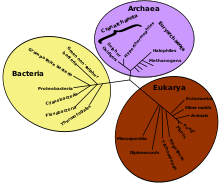 "Human evolution: taxonomy and paleobiology". Journal of Anatomy. 197 (Pt 1): 19–60. doi:10.1046/j.1469-7580.2000.19710019.x. PMC 1468107 . PMID 10999270. p. 41: "A recent reassessment of cladistic and functional evidence concluded that there are few, if any, grounds for retaining H. habilis in Homo, and recommended that the material be transferred (or, for some, returned) to Australopithecus (Wood & Collard, 1999)." 1 2 Australian Museum: http://australianmuseum.net.au/Homo-habilis. ↑ Miller J.M.A. (2000). "Craniofacial variation in Homo habilis: an analysis of the evidence for multiple species". American Journal of Physical Anthropology. 112 (1): 103–128. doi:10.1002/(sici)1096-8644(200005)112:1<103::aid-ajpa10>3.0.co;2-6. ↑ F. Spoor; P. Gunz; S. Neubauer; S. Stelzer; N. Scott; A. Kwekason; M. C. Dean (2015). "Reconstructed Homo habilis type OH 7 suggests deep-rooted species diversity in early Homo". Nature. 519 (7541): 83–86. doi:10.1038/nature14224. ↑ "Vertebrate fossils record a faunal turnover indicative of more open and probable arid habitats than those reconstructed earlier in this region, in broad agreement with hypotheses addressing the role of environmental forcing in hominin evolution at this time." Erin N. DiMaggio EN; Campisano CJ; Rowan J; Dupont-Nivet G; Deino AL; et al. (2015). "Late Pliocene fossiliferous sedimentary record and the environmental context of early Homo from Afar, Ethiopia". Science. 347: 1355–9. doi:10.1126/science.aaa1415. PMID 25739409. ↑ Donald C. Johanson; Fidelis T. Masao; Gerald G. Eck; Tim D. White; Robert C. Walter; William H. Kimbel; Berhane Asfaw; Paul Manega; Prosper Ndessokia; Gen Suwa (21 May 1987). "New partial skeleton of Homo habilis from Olduvai Gorge, Tanzania". Nature. 327 (6119): 205–209. doi:10.1038/327205a0. PMID 3106831. ↑ Wood, Bernard (21 May 1987). "Who is the 'real' Homo habilis?". Nature. 327 (6119): 187–188. doi:10.1038/327187a0. PMID 3106828. ↑ Ungar, Peter (February 9, 2012). "Dental Evidence for the Reconstruction of Diet in African Early Homo". Current Anthropology. 53: S318–S329. doi:10.1086/666700. ↑ Pollard, Elizabeth. Worlds Together, Worlds Apart. 500 Fifth Avenue, New York, N.Y. 10110. p. 11. ISBN 978-0-393-91847-2. The Making of Mankind, Richard E. Leakey, Elsevier-Dutton Publishing Company, Inc., Copyright 1981, ISBN 0-525-15055-2, LC Catalog Number 81-664544. Wikimedia Commons has media related to Homo habilis.